A great art historical controversy has engulfed Italian academia and the press, surrounding the authenticity of a piece traditionally attributed to Raphael, The Vision of Ezekiel. Recorded as being part of the Medici collection since 1589, it was initially housed at the Uffizi. After Napoleonic forces plundered Italy, this small panel was spirited away to Paris in 1799, not returned to Florence until 1816. It is now part of the collection at the Palatine Gallery at the Palazzo Pitti. There are in fact differing accounts in Italian art historical sources related to the original date of this work. It was established as first belonging to the Ercolani family of Bologna, prior to it being ceded to the Medici collection. Vasari states that it was created after 1514, whereas Malvasia, a 17th Century art historian from Bologna cites it as being created previous to this. There is mention of a transaction between Raphael and the Ercolani in 1510, though it was for a small amount of money, inconsistent with a Raphael commission at any time after 1510. Some authors have suggested this was a form of down payment, but others argue against this, stating that such payments were not typical for a small piece. Some monographs also float the possibility of this being a work completed by Raphael pupil Giulio Romano, hence dating it at a period after Raphael's death in 1520. The evidence these scholars have based their detailed speculations on is less discernable. Another contribution to the widely published date of this piece refers to Raphael's exposure to Michelangelo's Sistine frescoes, and his own involvement in executing the frescoes for the Stanza della Segnatura at the Vatican. Hence, as a result the date often ascribed to this piece is c.1518. Until further evidence comes to light however, this date can be described as speculative at best. Creation of the Sun, Moon and plants from the Sistine cycle - a stylistic antecedent? Fast forward to 2011 - in an article published in L'Espresso, art historian Roberto De Feo submits that the Pitti Raphael may be a copy. This conclusion was reached following a three year investigation by De Feo into known copies of this work. The sensationalist manner this news has been presented in Italy has caused great contention, where journalists and some academics are somewhat less cautious when it comes to reining in emotions, as opposed to trying to uncover evidence. Subsequent to the L'Espresso piece, many notable figures in Italian art history and Raphael studies have chimed in. A wonderful summary of the Italian press' coverage of this drama is presented at storie dell'arte, posted by Serena D'Italia. I would also like to thank storie dell'arte contributor Sergio Momesso for his assistance in helping me navigate this story to present it here in English. Whilst observing the antics of the Italian press and some less-reserved academics is amusing from a distance, it does little to shed light on what the main focus of these articles should be - the exact nature of the documentary, stylistic and scientific data on the Pitti piece in comparison to other known versions. Looking through my own growing library on technical documents pertaining to Raphael studies, there is little mention of the Pitti Ezekiel piece, which seems to have gone largely unassailed as an authentic Raphael. Doubt seems to have first crept in with Crowe and Cavalcaselle's late 19th Century opus on Raphael, with the Romano involvement later suggested by Rosenberg and Gronau in the early 20th Century. It was surprising to note this story had not made an impact in the English language art press, particularly after Nicholas Penny, curator of the National Gallery London - the man behind the re-discovery of the Madonna of The Pinks weighed in recently, stating he was aware of existing copies, but has little doubt that the Pitti version is by Raphael's hand. Knowing the contested state of evidence for The Pinks, one can only surmise Penny is again asking the public to bank on his uncanny skills at Raphael divination, rather than outlining the nature of the evidence pertaining to the pieces in question. What can be stated categorically is that the contents of De Feo's investigation, and the documents scrutinised within are not publicly available. Many scholars commenting on the issue have not read De Feo's piece, and are merely responding to the immense hype Italian media has generated. Until this evidence is made available, anyone commenting on it is exercising little more than personal opinion, as opposed to applying an analytical process. Of great interest is that he is sitting on a throne of symbolic creatures. This was also in Ezekiel's vision, as described in Old Testament. It was a later writer, St Jerome that established these animals as representatives of the Gospel authors - a tradition that was to filter into art from the Early Christian Period, through the Middle Ages and into the Renaissance. Matthew was represented as a man with wings, Mark a lion, Luke an ox and John as an eagle. It is fascinating to note Ezekiel himself is quite diminutive in this image, shown receiving his vision on the lower left hand corner. This great disparity in scale is quiet unique, and shows Raphael's openness to ideas being introduced not only by Michelangelo but elements of Venetian and Flemish painting, such as the use of landscape details to add to the allegory, rather than merely provide a backdrop to an image. As far as the ongoing controversy surrounding the Ezekiel piece, until De Feo's work is published, there is little value in joining in the heated debate. Further details revealed in the Italian or academic presses will be presented here as they are made available. The four figures surrounding God are the four Evangelists, Matthew, Mark, Luke, and John-- writers of the four Gospels. Luke was not one of the Twelve. The four creatures in Ezekiel found their way into the Book of Revelation (Apocalypse) as the four living creatures. Later, they would become identified with the Evangelists. Emile Male has pointed out that Matthew is shown as a winged Man because his gospel begins with the genealogy of Christ. Mark is a lion because his gospel begins with John the Baptist, whose voice crying in the wilderness was equated with the lion's oar. Luke is an Ox because his Gospel emphasizes the sacrificial role of Christ. John is always shown as an Eagle because his mystical ideas soared towards the heavens. Thanks for another informative and well-researched post. Cheers for the clarification Frank, I have tweaked the post to suit. It's interesting to chart the development of these symbolic motifs over the centuries - a handy tip for anyone looking at symbolic animals in Early Christian, Medieval and Renaissance art. There could be an argument, on stylistic grounds, for it being by Romano. The composition doesn't quite work as an aerial ensemble, and nobody was better at drawing the figure in the sky than Raphael. The colouring, to my eye, seems to be more typical of Romano. 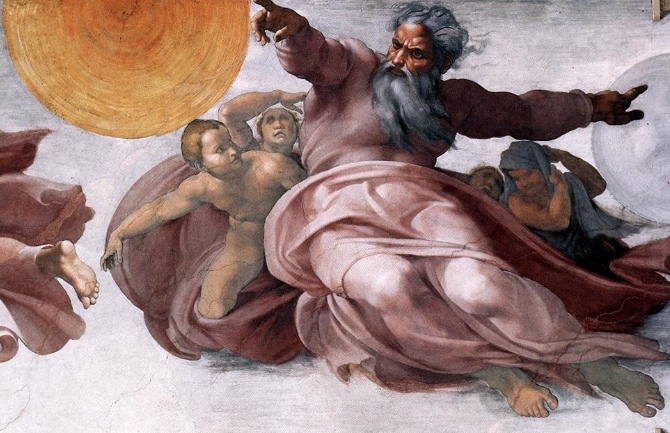 I don't think Raphael could convey Michelangelo's terribiltá when painting the divine; compare his images of God creating the world in the loggia sequence for Leo X a few years later, which are based on Michelangelo. Raphael’s God seems gentler, less threatening. Ezekiel seems modelled on a classical Jupiter, and this figure doesn’t quite square with the character of Jupiter as painted in other Raphaels, like the Jupiter in the Farnesina, although there are problems of who painted what there. Having said that, I don’t see a reason for taking it away from Raphael, unless somebody comes up with ironclad arguments. I suspect my thoughts are close to the connoisseurship of Crowe and Cavalcaselle, but I’ll have to check. What this problem illustrates is that we don’t know enough about the function of copying in the workshop: to what extent could the Ezekiel be Raphael’s original conceit re-worked by Romano? It would still be “Raphael” as a brand. See Damisch's discussion of Raphael in "The Judgement of Paris" on this. It would be helpful if this forthcoming research does tackle the problem of copies in the workshop, which obviously has a bearing on recent claims made about re-discovered “Raphaels”. It’s funny you came up with this, because I’ve been thinking about Raphael’s representation of the divine compared with Michelangelo’s for something I’ve been teaching recently. Very interesting post! I'm glad that you can introduce this topic to an English-speaking audience. As you said, anything said about this attribution and the De Feo piece will be personal opinion, at best. Do you know any information on when De Feo's research will be published in detail? I assume that the "L'Espresso" piece doesn't include his full argument, correct? @David - it's true for artists that had such a busy workshop - as Raphael did - that in assigning attributions some consideration needs to be made of the degree of involvement of that workshop's head. This seems to be a consideration that perplexed previous scholars much less, but now that we have obscene amounts of money assigned to such works, these details really need to be addressed. Beck's volume on 'The Pinks' does a nice job at delineating the degrees of potential involvement of Raphael in that piece, a framework which could easily be applied to product of any artist with a thriving workshop. @M - That's pretty much correct as far as I can tell! The original article pdf is provided in the references for your perusal ; L'Espresso is more a news journal(and site) than a specialist art publication. In fact a portion of it is quite clear in stating that De Feo's research has only been seen by a select group of scholars, presented in April. The headline is actually a recommendation from Urbino scholars to Pitti staff to exercise more caution - namely recommending them to stick to the evidence than partake in the heated media exchanges that ensued. I'd be interested to see what De Feo dug up - it obviously has made a few people uncomfortable! Roberto De Feo is only waiting for a real academic discussion about his investigations. In your blog you've hit exactly the point: many people speaking about what they do not know, but trying to freeze the present conditions. We're helping De Feo to spread the existence of his studies out of Italy, in order to have more people asking for a clarification. @anon - many thanks for the comment. It was important to get the true details of this news out in English, and it is now easily accessible when searching for 'Raphael Vision of Ezekiel' in Google. As more details of De Feo's research are made available, they will be reported here with the high level of detail it deserves to properly represent it. Dear All! I am trying to get hold of Mr. De Feo. Can you please let me know if any of you can help.